He walked in and slammed the door. He was stomping off to his room before I could even say “how was your day”? I knew I needed a way to really connect with my son, but more and more it felt like we had no common ground. Sitting down to a planned activity with mom was definitely not on his agenda, and we didn’t just naturally find ourselves doing the same thing as often as we used to. Because I can pull out any sort of STEAM activity, all of the kids can’t help but join in! 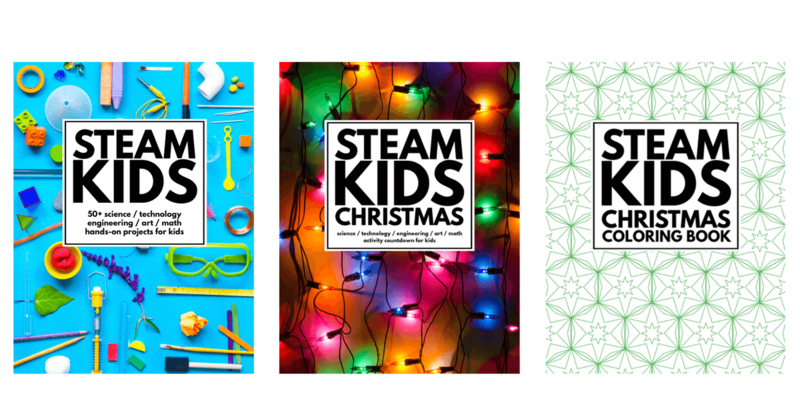 Whenever we join together to complete a STEAM activity, our brains are engaged and engrossed in learning and exploring that sometimes it becomes even easier for us to connect and talk. 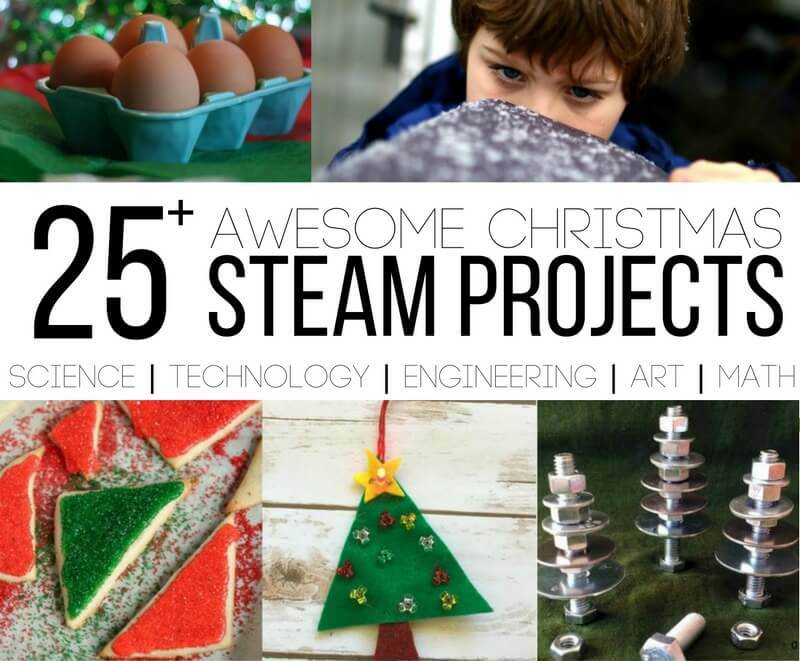 With that kind of success, it’s no surprise that I’m trying to find some STEAM gifts for the kids this year! 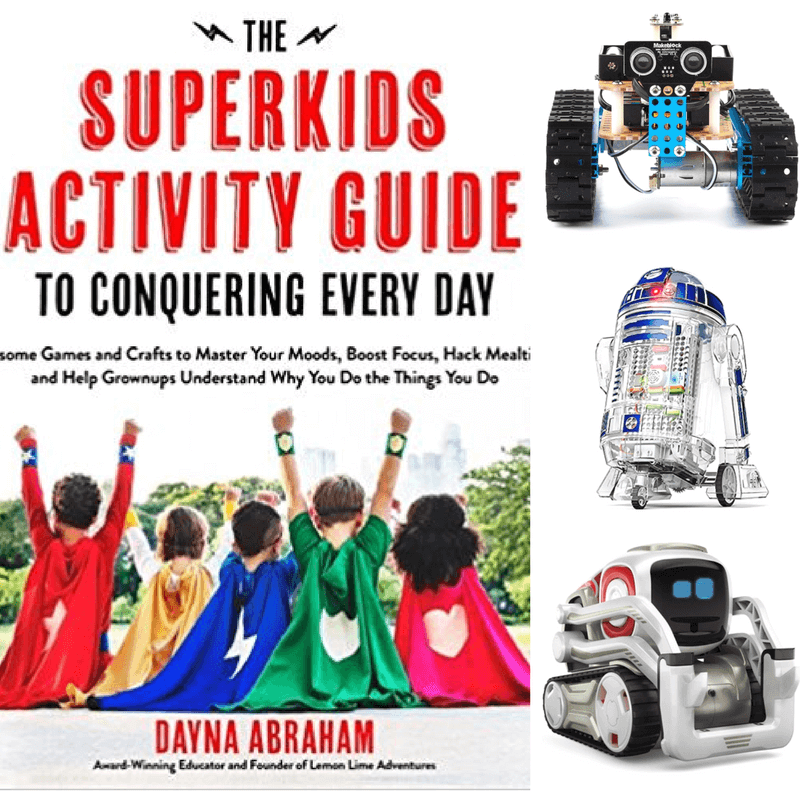 Superkids Activity Guide: If you’re looking for a constructive way to keep kids busy, my book is full of ideas that spark curiosity and learning. Cozmo: Programmable fun tucked inside of an incredibly small robot! Don’t let his size fool you! Star Wars Droid Inventor Kit: Kids can build, program, and control R2-D2. I bet they will never get tired of this gift. 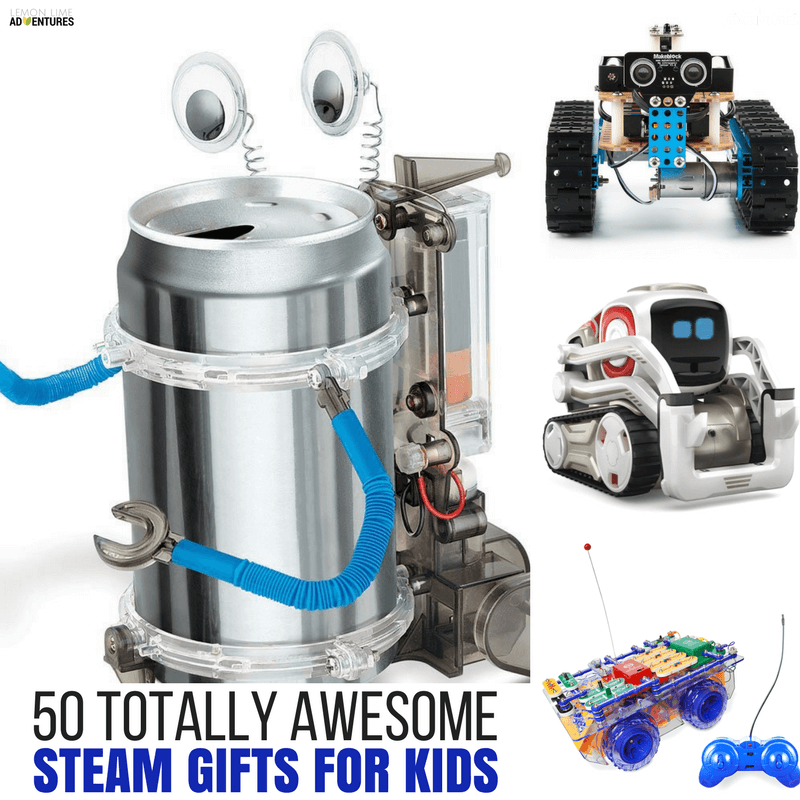 Cubelets SIX Robot Blocks: The possibilities are endless with this STEAM gift idea. Users can create over 500 different robots, all with a special function. Makeblock DIY Starter Robot Builder Kit: Build robots that can be programmed to work together and complete different actions. Meccano-Erector M.A.X Robotic Interactive Robot: Between programming and a little bit of artificial intelligence, you’ll create one interactive robot that learns over time. Wonder Workshop Dash Robot: Learn how to code by programming this robot to perform a variety of tasks including dancing. Metal Detector Robot: Going on a treasure hunt just got a little more interesting with this robot. Makey Makey: Turn any object into a usable touchpad that hooks up to the computer or smart device. All you need to do is hook the gadget up with a few alligator clips. 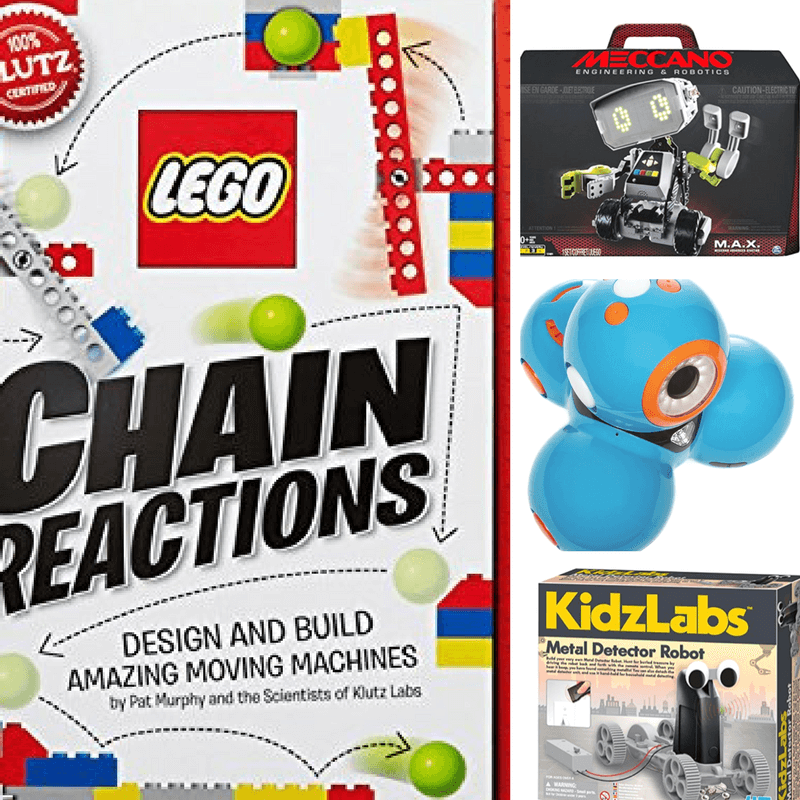 Klutz LEGO Chain Reactions: For more LEGO favorites, check out my LEGO Gift Guide. Kids First Automobile Engineer Kit: This kit is the perfect way to introduce preschoolers to engineering. Grow ‘n Glow Terrarium: Creating a terrarium just got a little more interesting with this kit. Smithsonian Diggin’ Up Dinosaurs T-Rex: Dig up some bones and build a T-Rex fossil model. 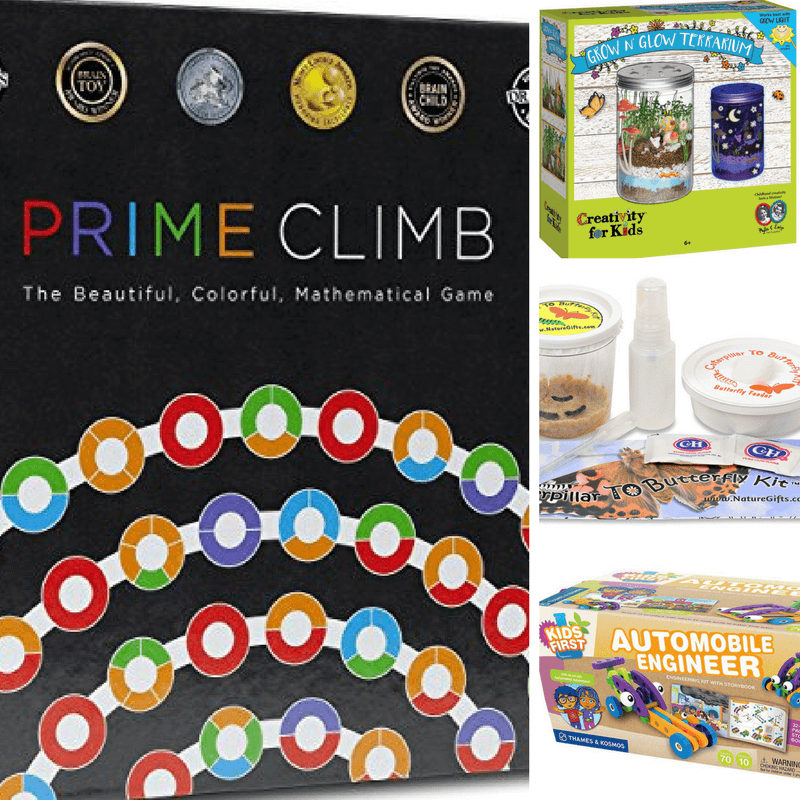 Prime Club Board Game: Learning how to multiply and divide can be a lot of fun with the help of this board game. Live Butterfly Kit: Watch caterpillars make their magnificent transformation right in front of your eyes! 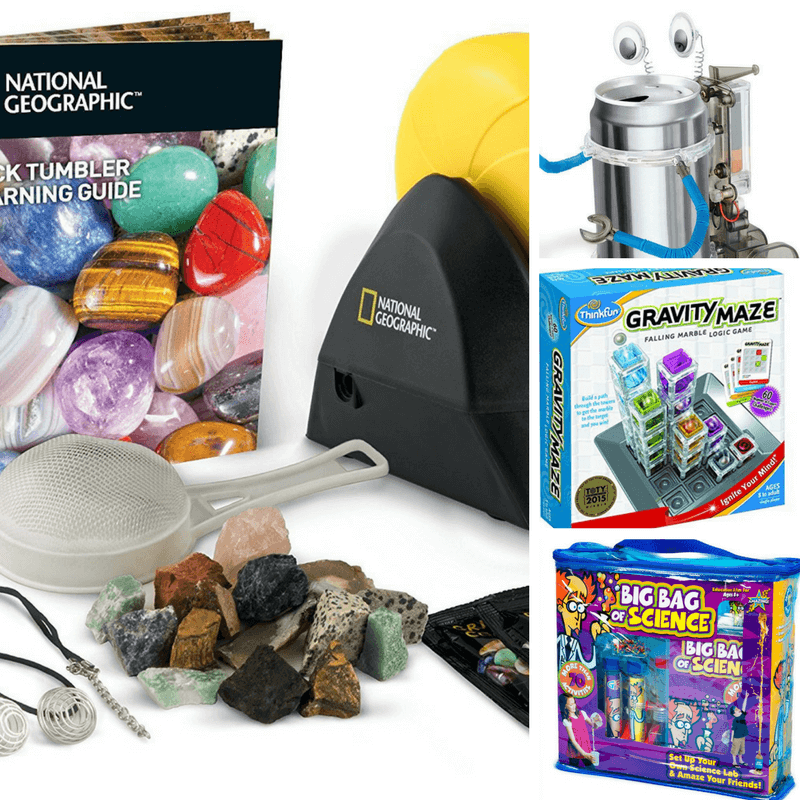 Big Bag Of Science: Become an instant scientist with all of these fantastic tools and experiments. Rock Tumbler: Turn rocks into gemstones by taking them for a spin in this rock tumbler. Break Your Own Geodes: Find out what beautiful gems are hidden inside of this set of geodes. Tin Can Robot: Recycling is important, now it’s time to make it fun by upcycling a soda can into a robot. Marble Maze: Use your noggin, marbles, and a dash of gravity to make your own marble maze. 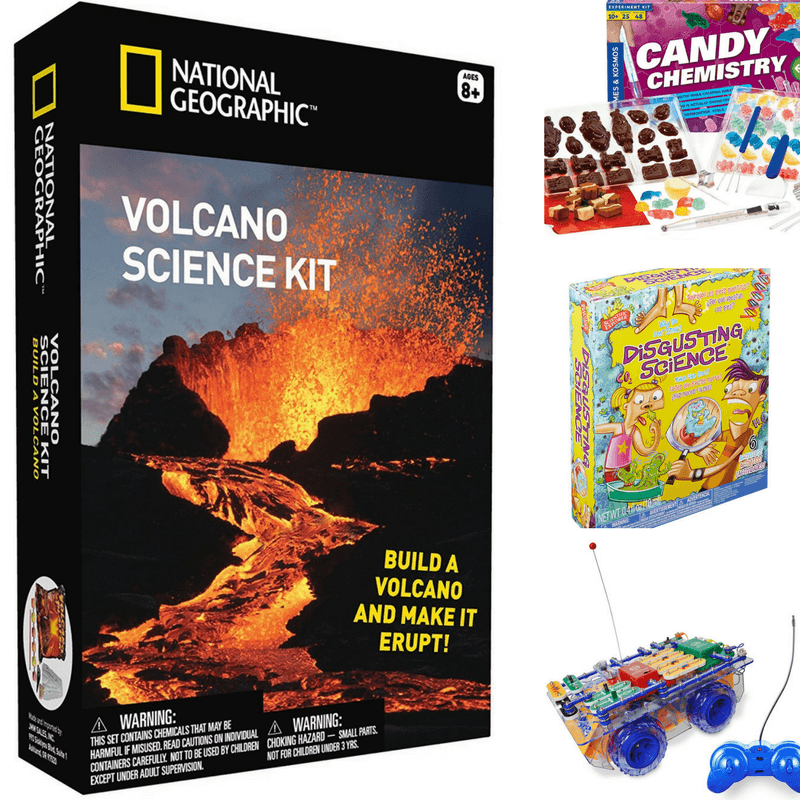 Volcano Science Kit: Science is amazing… especially when it comes in the form of an erupting volcano. Squishy Circuits: Use clay to make an electrical circuit. Candy Chemistry: Candy does make learning fun! Disgusting Science Kit: Germs can also make learning fun, especially if your kiddos love to be grossed out. Snap Circuits R/C Snap Rover Electronics Discovery Kit: Remote control powered car…. meet Snap Circuits! Crystal Growing Kit: Thanks to science, and this kit, you can watch crystals form right before your eyes. Stomp Rocket: Build a rocket and use your stomping power to launch it into the air. Rule Your Room Kit: Lockdown your room and keep everyone out by making alarms and sensors to detect sneaky siblings. Geckobot Wall Climbing Robot: I don’t think robots could get any cooler! This one walks on walls. 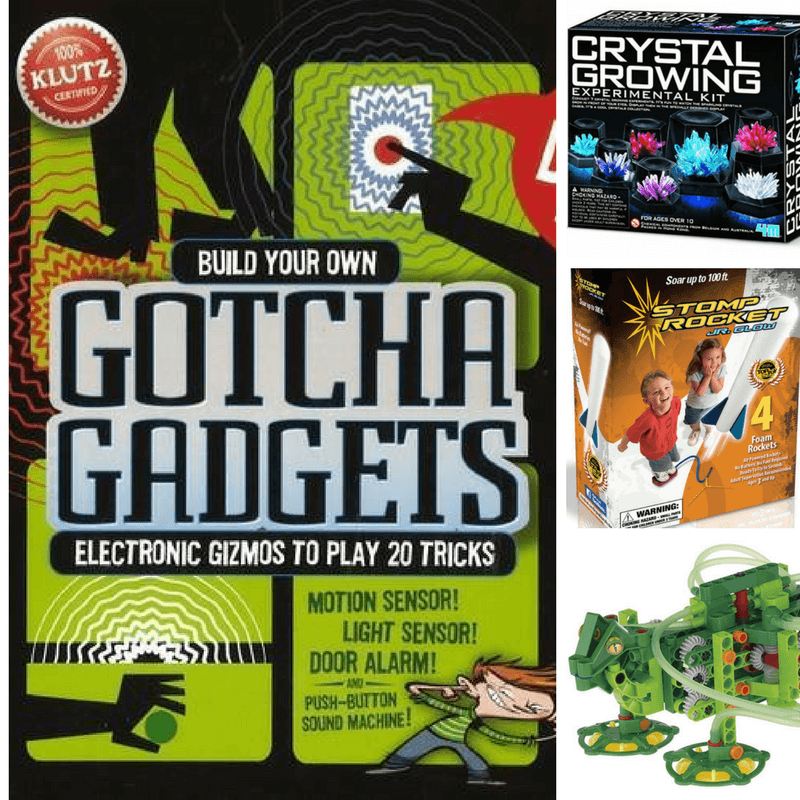 Klutz Build Your Own Gotcha Gadgets Craft Kit: This kit is full of gadgets to build including a sound machine. Spirograph Deluxe Set: Make detailed designs and creations by using the tools that come in this set. Classic toys such as this never get old. Dance Code Princess Belle: Program Belle to dance! Play-Doh Touch Shape to Life Studio: Play-Doh just got a techy spin! Hide and Seek Rock Painting Kit: Let’s turn nature, into art, shall we? 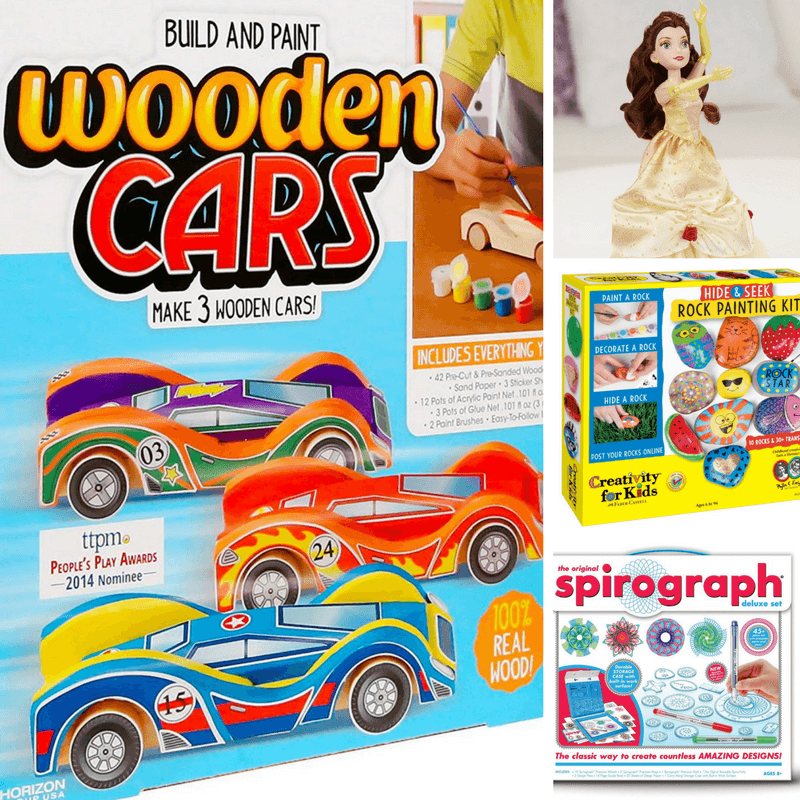 Build & Paint Your Own Wooden Cars: Once you’ve built the car, you can paint it to make it look just the way you like. Pottery Wheel: Introduce the kiddo on your gift list to the amazing world of pottery. 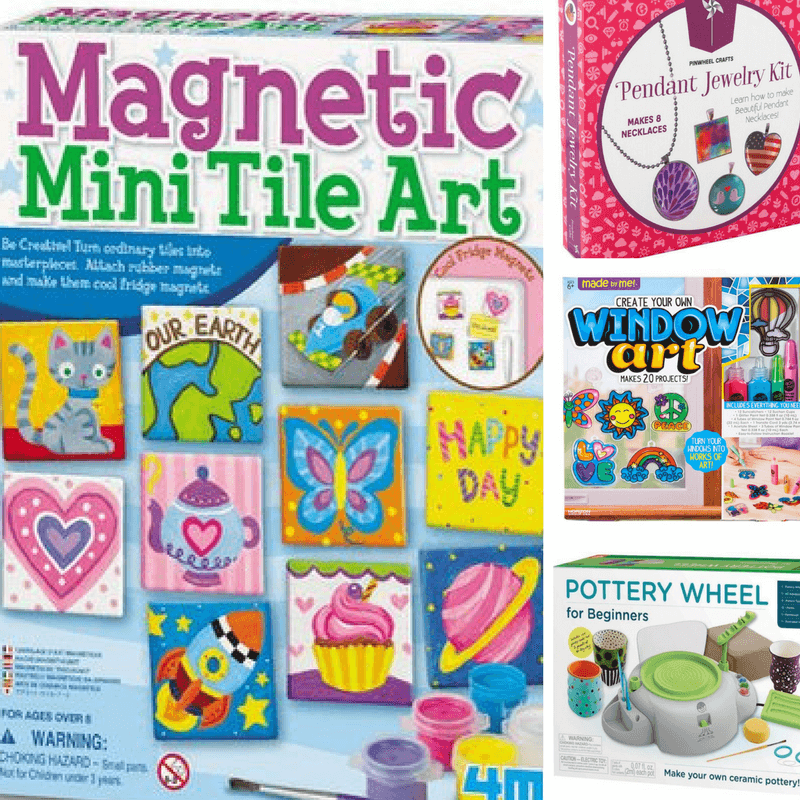 Magnetic Tile Kit: Make art, and a functioning magnet or two. What a creative way to display artistic creations. Window Art: Dress up windows with a little bit of art. Pendant Jewelry Kit: Learn how to make pendants with this kit. Mastermind for Kids: Players learn how to build a code and how to break the code. A great game for the budding scientist. Water Globes Under the Sea: Capture a scene from under the sea by making water globes. 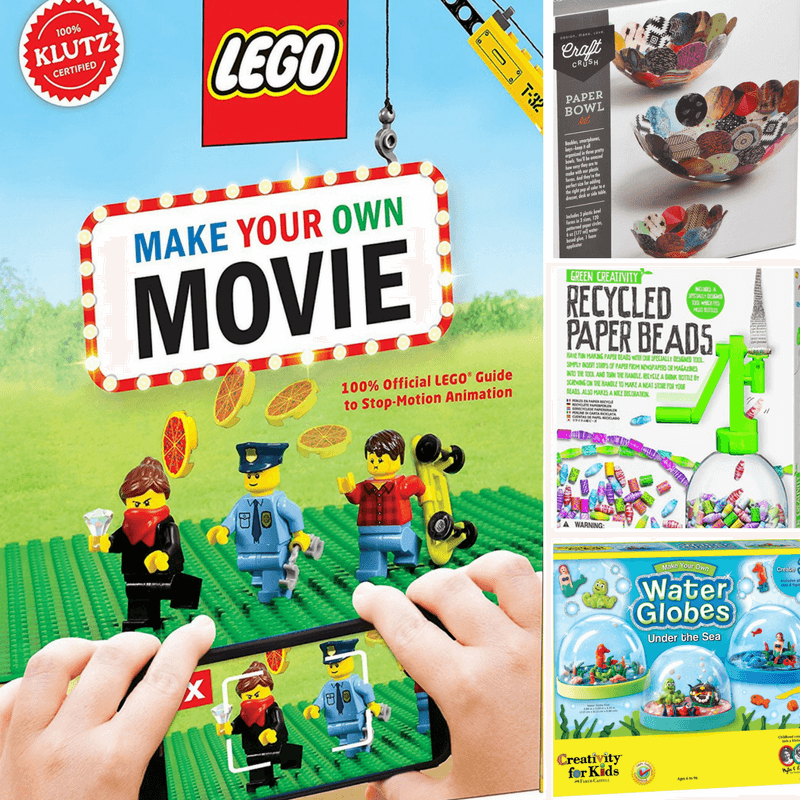 KLUTZ LEGO Make Your Own Movie Kit: Make stop-animation movies with the help of LEGO blocks. Draw It 3D: Learn how to draw in 3D! Recycled Paper Beads: Make beautiful beads by recycling any type of paper, even newspaper. A great way to get use out of all those paper scraps. Paper Bowl Kit: Create 3 bowls that can hold keys, change, and trinkets. 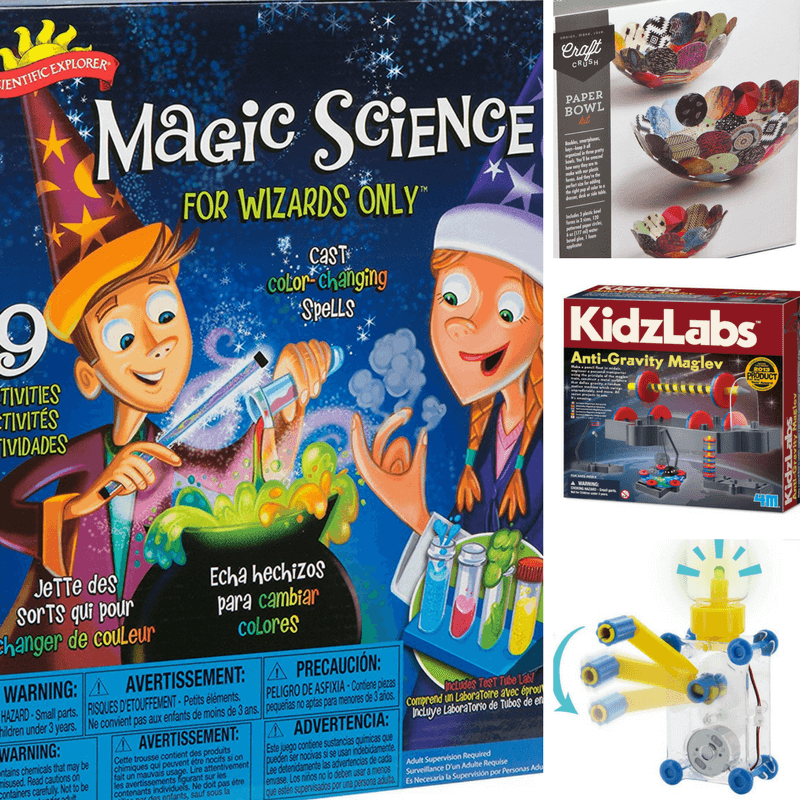 Magic Trick Science Kit: Become a wizard by whipping up some magic tricks that involve a bit of science. Leonardo da Vinci Catapult Kit: Learn how da Vinci built the very first catapult by building one yourself. Anti Gravity Magnetic Levitation Science Kit: At first glance, this looks like a magic trick, but don’t be fooled because all of the force coming from this kit is caused by a magnetic attraction. Flying Dragons: All you need to do is fold these paper dragons to help them fly! Hand Cranked Power Generator: Build a generator that only needs a little hand power to generate electricity. 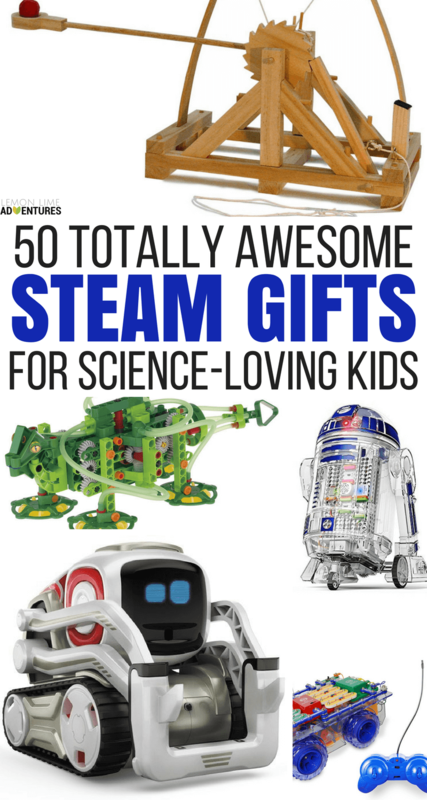 Any kiddo would be thrilled to receive any of these gifts! 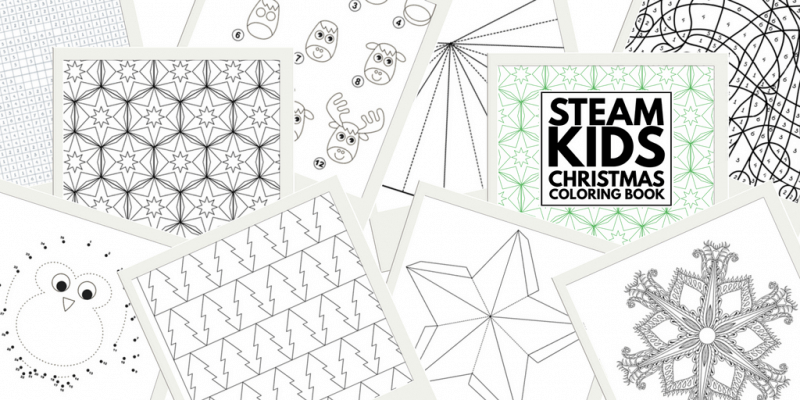 I don’t know about you, but I am pretty excited about the coloring book and just how much stress this will save during the holiday season! I’m printing it off right now and adding it to my calm down kit for my kiddos. I know this will come in handy this season!